Hi crafters! 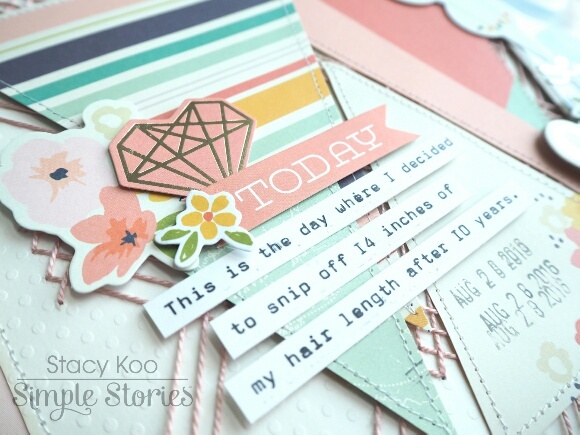 I'm on the Simple Stories blog today with 2 layouts using Posh collection. This collection simply took my breath away! The colors and theme rhymes with my new hairstyle! I have had long hair for at least 10 years now. Through the years, I've changed some styles in between, but my hair was always below my shoulders. 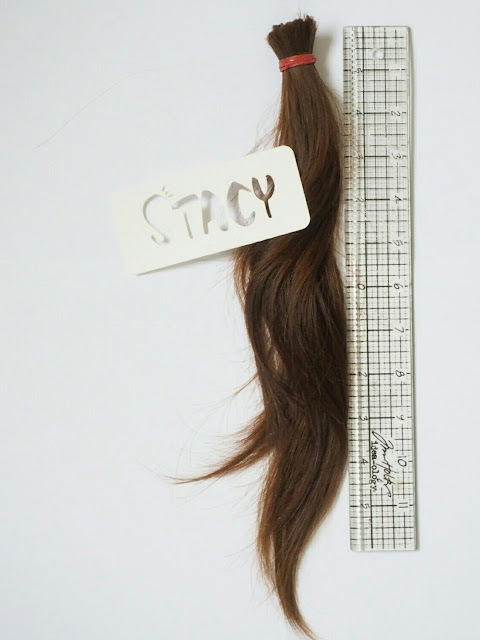 Before I made the dive to cut my hair really short, my hair length was at my waist. Here's how much I really cut off. (possibly more since the hair stylist had to do some trimming). Yes. That is quite a move! Therefore, I decided to document this journey with the Posh collection! It's the best collection to go with the new look! 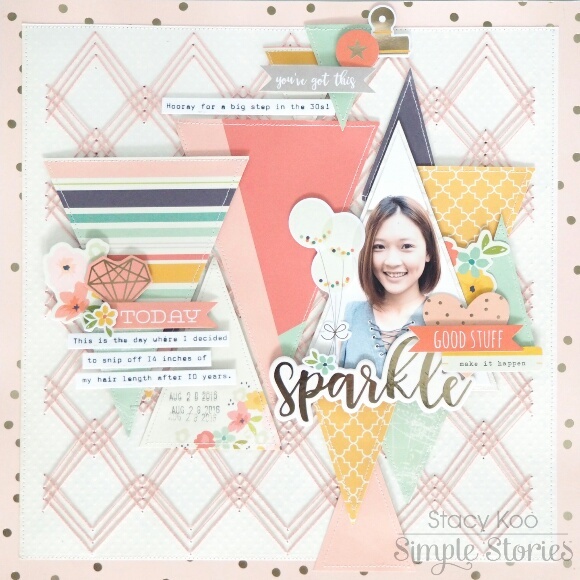 For my first layout "Sparkle", I added some stitches to the background of this layout. I found that it added another layer to the entire layout, and helps to enhance the pattern papers on top of them. I also like to use basic shapes on layouts to highlight the beautiful pattern papers in the collection! 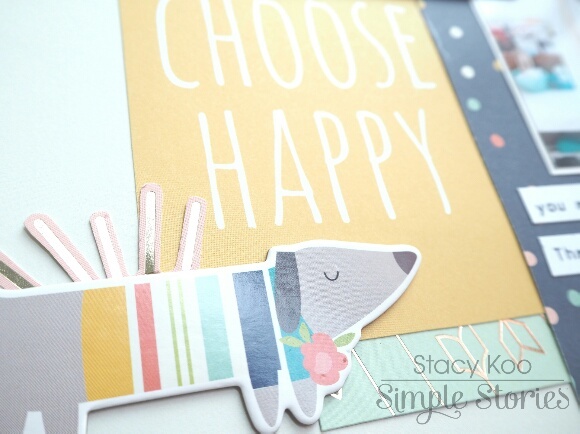 Basic shapes are ever lasting details which you can add to layouts but not overbearing them. To add some fun details, I added some simple machine stitch on each triangle to outline it. Not only does it further define the triangle shape, it also helps to create focus for the embellishments on top of it! Here I have used elements from the bits and pieces pack. I must say, this pack packs a POW! Totally in love with every single piece! 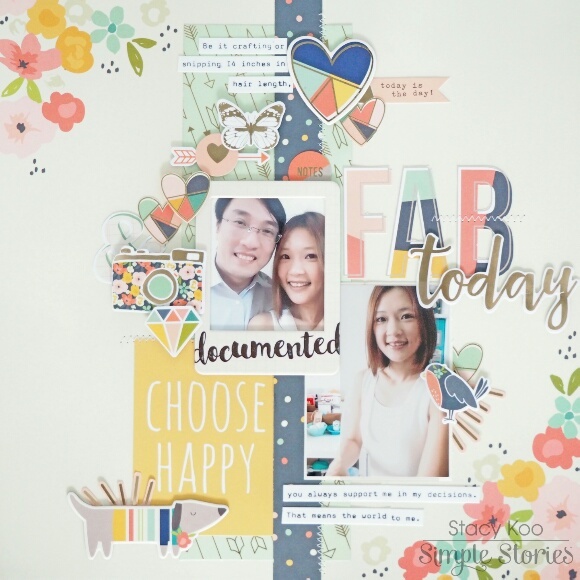 Don't forget to add some journaling to your layout! I realised that I have already forgotten much details on earlier layouts which I had not done any journaling. It is always good to document and highlight it with pretty embellishments! There are so many useful and pretty elements in this bits and pieces pack! It was a breeze working on this layout! A little more detail on the stitching and my favorite element in this layout - the chipboard "sparkle". Well, as the word says so indeed! I love that shine of foil! It gives a subdued shine, good enough not to steal the limelight of my photo! It is the perfect piece! For the next layout, I had to document the start of my new look and the support from my husband. While creating this layout, I started thinking about the support from my husband and the fact that he was my pillar in times of good or bad. Then I decided to create a vertical background where the vertical strip denotes pillar and timeline. It might sound wierd, but i get ideas like that to start my layout! I had a lot of fun with the decorating, you can say I was spoilt for choices! I did not have to look too hard to find the title, the 4x4 & 4x6 Vertical Journaling elements was sitting right in front of me with the exact title I needed! Some fussy cutting, and then sewing it onto the layout. Then, just because I am in love with the foiled elements, i decided to add another just below my title! 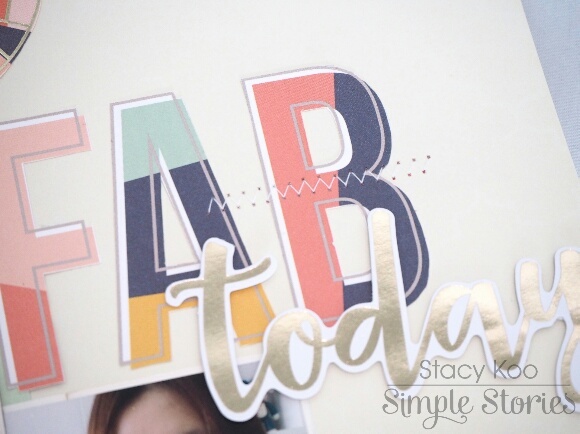 The foil "today" is from the Posh - Bits & Pieces pack too! Seriously, I am having too much fun with the foiled embellishments. Here are some more from the bits and pieces pack! The chipboard stickers have also foiled bits, like the heart I have used below. Throughout the layout, I have also added some stitching to the "pillar" to create some added interest. 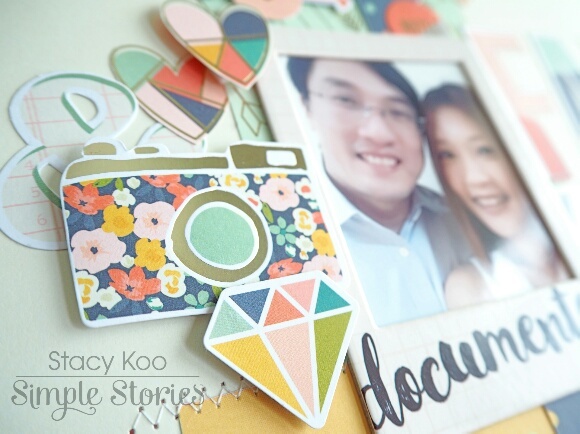 Using the chipboard frame from Life in Color collection for my main photo together with the pretty POSH elements! 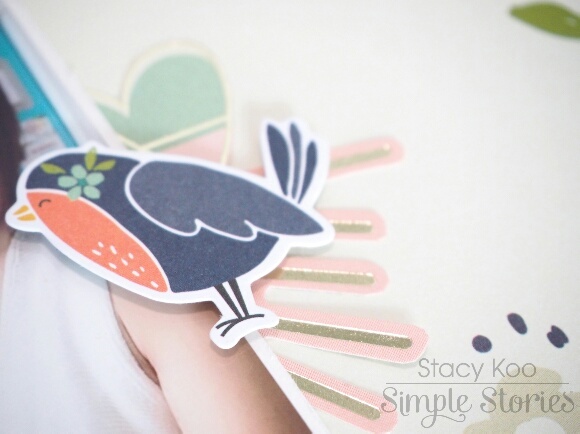 This bird element is perfect! 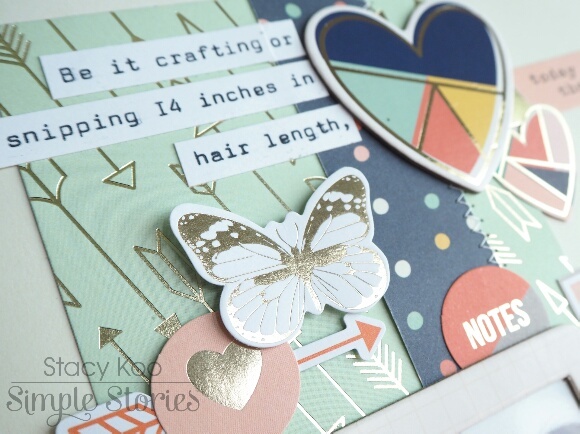 I wanted to give it a glow so I went ahead to do some fussy cutting on the 3x4 Journaling Card elements. 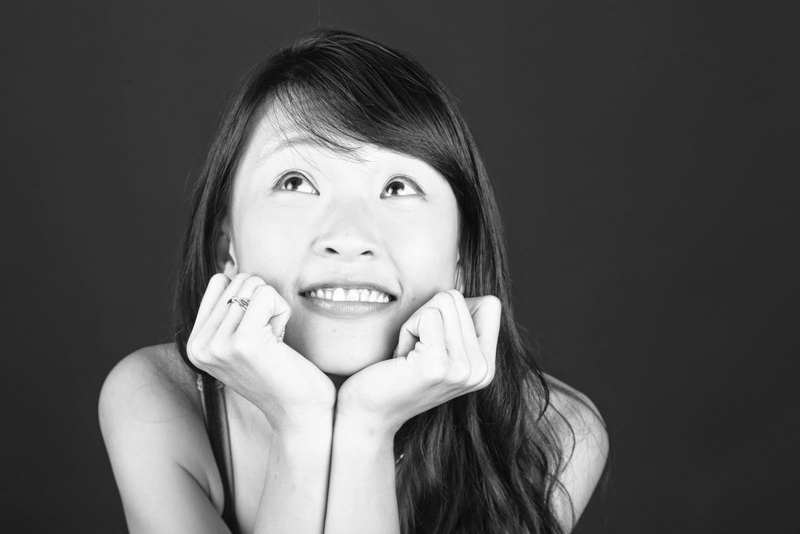 It is the one with the word shine. I decided to save the word for future use, but just using the lines to create a glow for a beautiful element! Similarly, i added the glow to Winston! Did you participate in the earlier naming contest in Simple Stories instagram? Winston is such an apt name for it, and I am so fond of it! I have also layered another 3x4 Journaling Card element here. 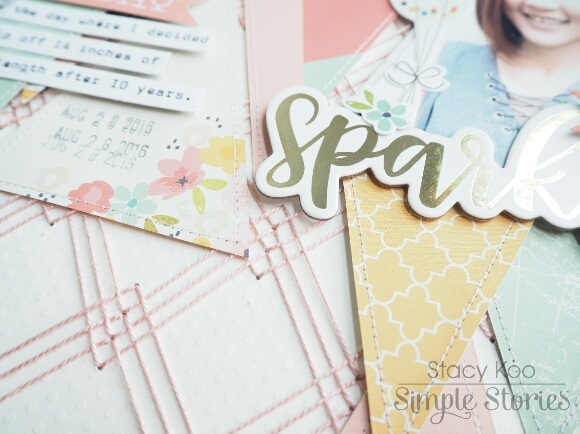 It is so simple to add layers with the journaling cards! So there! 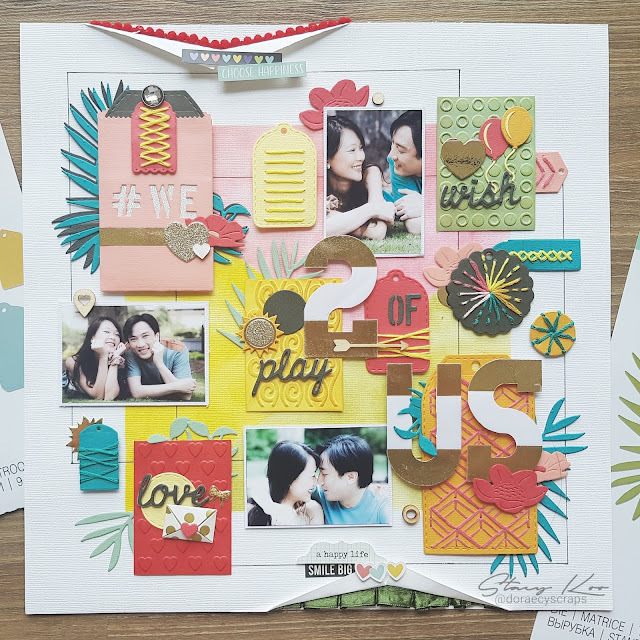 I hope you have enjoyed the walk through of these 2 layouts and hope they inspire you to do something creative!